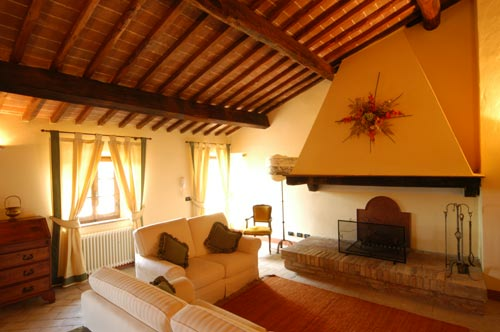 "Villa Il Noceto", a traditional Tuscan farmhouse in stone, is located 500 meters from the village of Montalcinello, along a typical path through the beautiful Tuscan countryside. 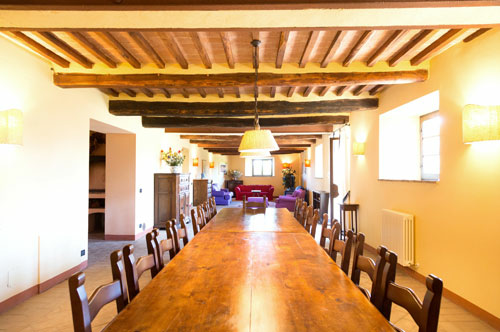 Perfectly restored with respect to the original design, furnished with antique rustic Tuscan furniture and fixtures and high-quality facilities, "Villa Il Noceto" guarantees a pleasant stay even during late autumn and winter. 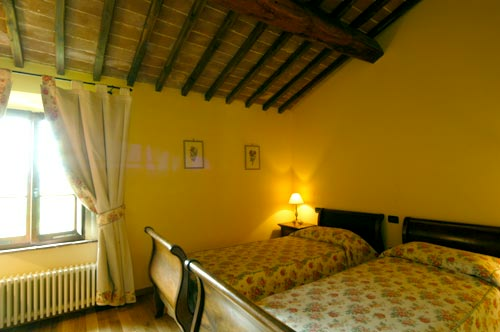 Being in a dominant position with respect to two small valleys, in "Villa Il Noceto" every window “frames” the wonderful Tuscan landscape. 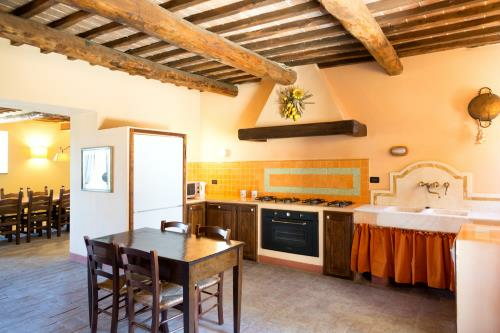 The structure consists of two separate units (the Casale, which can accommodate up to 12 people, and the Villetta that can accommodate up to 4) which are completely self-sufficient but which, taken together, form a typical Tuscan “borgo”. 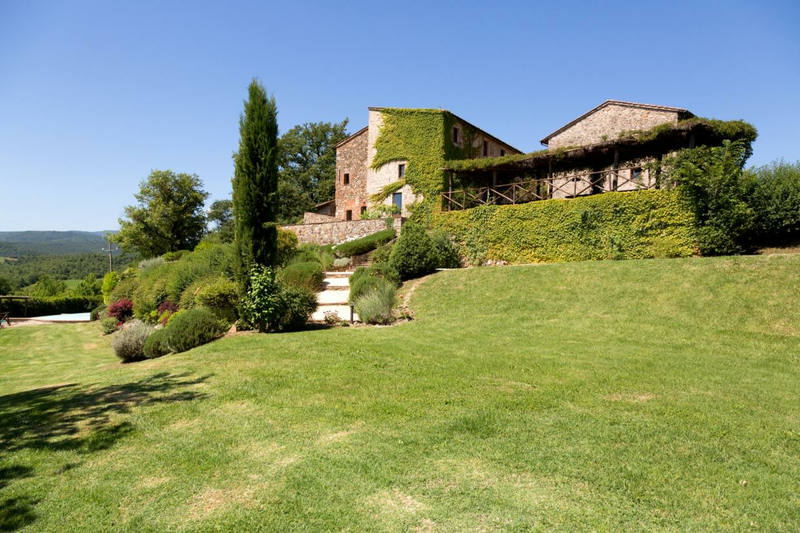 Although structured as a private residence, "Villa Il Noceto" has earned the title of "4 ears” in the agritourism sector, for the quality of comfort it offers and for the way in which clients are received. 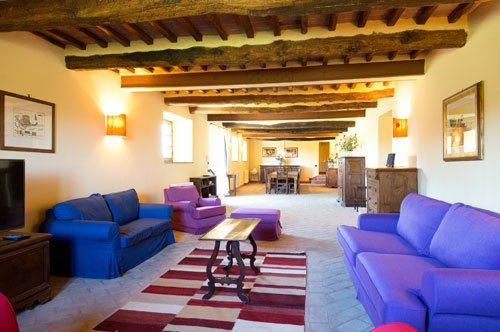 "Villa Montalcinello" is a few steps from the Villa Noceto. 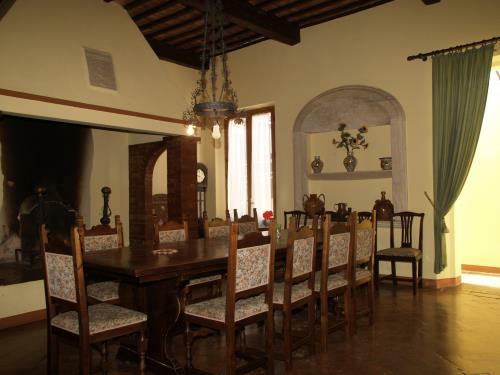 This property is situated in a former convent dating to the 14th century and situated on the hill of the medieval village of Montalcinello, a location which offers a breath-taking view. 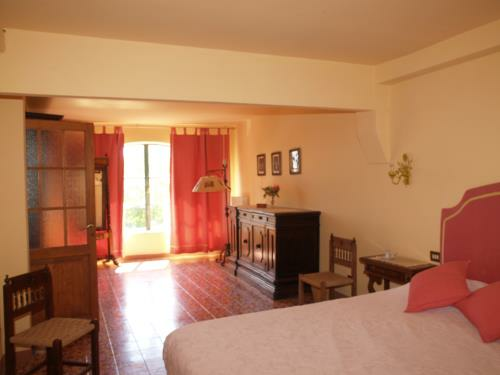 The Villa was restored for the first time in 1925 and then, more recently, there were further renovations which maintained the period characteristics, this give the building an elegant and refined atmosphere. While a wooden gate gives access to a small square near the country church, "Villa Montalcinello" is surrounded by walls within which you can admire a beautiful garden with a swimming pool. Located between Siena, San Gimignano and Florence, it is less than an hour's drive from Follonica and the famous Punta Ala. 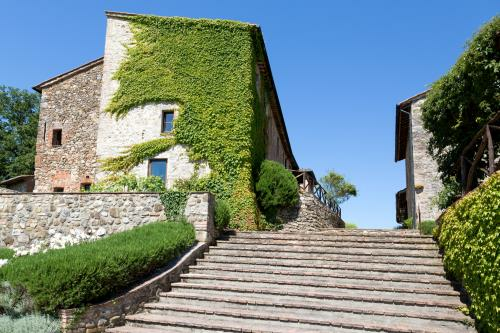 This building, erected by San Galgano da Chiusdino in the 12th Century on a hill which was reminiscent of Monte Siepi, is situated in the valley of the river Merse, a few kilometres from Siena. Legend has it that, after a life dedicated to luxury, the knight Galgano Guidotti, born in Chiusdino, abandoned his earthly goods to retire in meditation at Montesiepi, where he died. At his death, in 1181, Galgano was proclaimed a saint and his figure linked to the stories of the Holy Grail and the Round Table. It is said that it was he who thrust his sword into the rock recreating the image of the cross of Christ with its hilt. Who has never heard of the legend of King Arthur and his noble knights and the legendary sword in the stone? 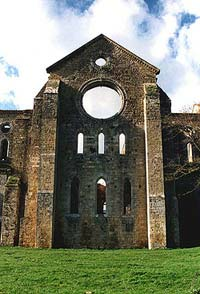 After a period of great splendour, thanks to constant pilgrimages and to the relics of the saint, the Abbey was completely abandoned and in 1786 the tower collapsed, and this led to the destruction of the roof of the nave. It was restored at the end of the 19th century and now appears as a majestic Gothic church, with large pointed arches and mullioned windows which create a wonderful play of light and shadows at sunset. The legendary sword in the stone is now preserved in the church of Monte Siepi and is under study in order to attribute a precise date to it. The village, which stands on a hill overlooking the Val d'Elsa, is named after the Bishop of Modena San Gimignano who, around the tenth century, saved the little village from the barbarian hordes. During the Middle Ages, San Gimignano went through a period of great development, thanks to its location in one of the most important of the Via Francigena, a crossroads around which trade revolved. Between 1000 and 1200, the village became highly prosperous and its first walls were built. Later 72 towers were built, they were symbols of prosperity. In 1199 it fought against the Bishops of Volterra and became divided into two factions, the Ardinghelli (Guelph) and the Salvucci (Ghibellines) and became a free commune. 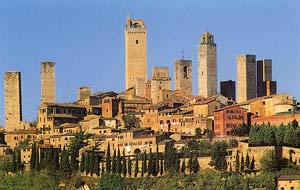 In 1300 San Gimignano had the honour of hosting Dante Alighieri, ambassador of Guelph in Tuscany, but the terrible plague of 1348 depopulated the village and thus began its great crisis; it was forced to submit to Florence and its inhabitants survived thanks to agriculture. It was only much later, when its beauty was rediscovered along with its important cultural works, that the village came out of the situation of decay and abandonment into which it had sunk. Its profile with its towers is known around the world and so is its wine, Vernaccia, which recently received the highest recognition of quality and guarantee of Italian provenance. It is home to a notable cultural event which is held in July, the international festival. 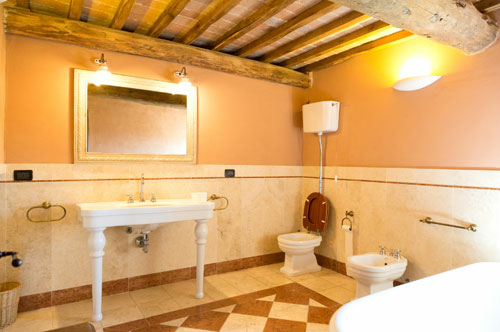 The city of San Gimignano has kept almost all of the original architectural features from the fourteenth century. Among the hills of Chianti and the Maremma in the centre of Tuscany, Siena appears; it is a city of medieval appearance with narrow alleys and noble palaces, all rich in history. 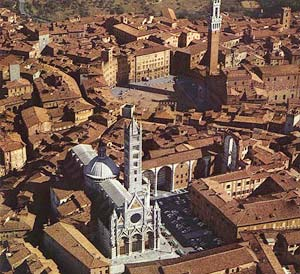 Siena, a place of Etruscan origin, was a Roman colony under Caesar with the name of Sena Iulia. According to legend, the city was founded by Senio, son of Remus, who was forced to flee with his brother Aschinus, after having had a heated argument with his uncle Romulus and chanced upon this area. Subdued by the Lombards in the fourth century, after a long period of episcopal dominion (9th-11th century), the city reached its peak becoming a municipality (1147), thanks to its strategic location and proximity of ore-rich hills, where silver was found. Confrontation with Florence became inevitable and this rivalry led to a war, which lasted until 1555 when, after a long siege, Siena was conquered by the Florentines and later became part of the Grand Duchy of Tuscany, until the unification of Italy in 1861. The city of Siena is rich in art museums; among them we find the OPA Museum that houses masterpieces by Duccio di Boninsegna and Giovanni Pisano, the civic museum in the Town Hall with works by Lorenzetti, the Art Gallery and the Santa Maria della Scala in Piazza del Duomo. The surroundings of Siena are also worth visiting, they are very different from each other but all are rich in the history and traditions of the past. In the south-east there are Montalcino and Montepulciano, known for its excellent wine, the Etruscan town of Chiusi, Monteriggioni, the abbeys of Sant'Antimo and San Galgano, west of Val d'Elsa and San Gimignano, known for its medieval towers. But the city of Siena is not only about art but also folklore: we are talking about the Palio delle Contrade or the Palio of Siena, the Italian popular event which is one of the most evocative and fascinating spectacles and at the same time a religious festival, in which a wild horse race is hotly contested by the different “Contrade”, the 17 districts of the city which date back to the fifteenth century. Twice a year, on 2nd July (the Palio for the Madonna di Provenzano) and August 16 (the Palio of the Assumption), there is a historical horse race in the Piazza del Campo. The Palio was born in the seventeenth century as a contest between the districts that trained their young people in case of a possible war. Initially there were 42 districts, but in 1730, the boundaries were redefined and the number was reduced to 17. Just ten districts participate in the race: the seven who were unable to participate the previous year and another 3 that are drawn by lots; they are distinguished by their emblems and their colours. The evening before the race, each district organizes an al fresco dinner; each has its own seat, its own church, a museum full of Palios won and other memorabilia and is governed by a steward who has full powers on the conduct of the race. Before the start of the race, the horse is accompanied to its church for the blessing and then, as bells ring, takes part in the historical procession in the Piazza del Campo. Finally, the last drum roll heralds the end of the parade and the outbreak of the firecracker marks the horses’ arrival on the scene. The whole square follows the race with trepidation, finally the winning cortrade cheers and runs through the streets waving proudly – claiming the title of “il CENCIO”. From its location on a hill 550 meters above the valley of the Cecina, Volterra, jewel of Etruscan, Roman, Medieval and Renaissance Tuscany dominates the unique landscape of the frills. It is a place of vast cretaceous expanses, furrowed by chasms that, over the centuries, have swallowed cemeteries, churches and cyclopean walls. On the edge of the precipice, there are remains of Etruscan walls and the Badia Church. In this "magical and mysterious" city, you can find traces of three thousand years of history, which have made Volterra unique amongst the cities of art. Vestiges of the Etruscan period include the Porta all’Arco, the necropolis of Marmini and the finds in the Etruscan Museum Guarnacci; the Theatre of Vallebona, however, is from the Roman period. The structure of the city, with its narrow streets, the tower houses and churches, is reminiscent of the Middle Ages; likewise Renaissance civilization has left its mark, with its superb palaces, but it has not affected the medieval atmosphere that surrounds Volterra. A city "of wind and stone", as D'Annunzio said, Volterra is also a city of museums. As well as the Etruscan Museum, we find the Art Gallery, with notable contemporary works from Siena and Florence, the Museo dell'Opera del Duomo, which collects works of jewellery and sculptures from 3rd Century Siena and the Museum of Sacred Art with paintings, sculptures, vestments and religious objects. Volterra is not only about art and history, but offers many kilometres of landscape to be enjoyed on foot, on horseback or by bike in which visitors can discover typical places and beautiful nature. Next to this pristine landscape, there is a high quality of life which is still on a human scale and an artisan craft which is unique in the world: alabaster. The processing of this warm and bright stone has been handed down from father to son for thousands of years and today it represents one of the greatest expressions of Italian and Tuscan artistry. Small masterpieces in alabaster can be found in the characteristic workshops of the historic centre and in numerous exhibitions in the city. We cannot forget to mention the famous gastronomic traditions of Tuscany with its ribollita soup, potatoes with tomatoes, Florentine tripe and lamprey. This area produces pecorino, ricotta, salami, and is one of the richest truffles. 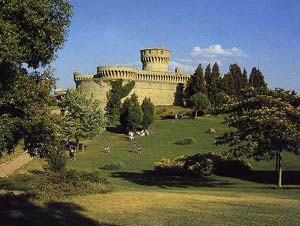 During the summer, Volterra also offers cultural events, such as Volterra theatre, concerts of classical and modern music and various art exhibitions and cultural events.